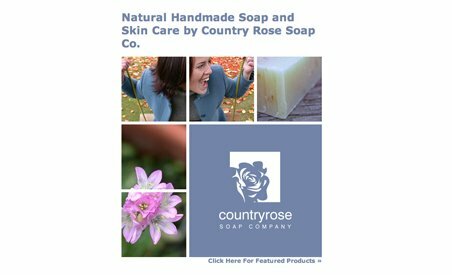 Country Rose Soap has spent the past 14 years producing the finest quality handmade soap available. The Surrey, BC based company offers over 50 types of soaps, as well as handmade bath products, lotions, salves, shampoos, and natural cleaning products, just to name a few. As a testament to the owner’s commitment to good business practices, most of the flowers and herbs used in their products are organically grown in their own garden. The soaps are always made in small batches, and some bars take a few days to make because of their unique texture and colour. Country Rose Soap has spent the past 14 years producing the finest quality handmade soap available. The Surrey, BC based company offers over 50 types of soaps, as well as handmade bath products, lotions, salves, shampoos, and natural cleaning products, just to name a few. As a testament to the owner’s commitment to good business practices, most of the flowers and herbs used in their products are organically grown in their own garden. The soaps are always made in small batches, and some bars take a few days to make because of their unique texture and colour. With over 150 products to choose from, Country Rose Soap can give you an unforgettable, all-natural pampering experience.